Although a self-acknowledged gear head, for me it's not all about the machines. What really fascinates me is the people who own them, and who use them. Sometimes the vehicle is just an element that adds more information about those people. 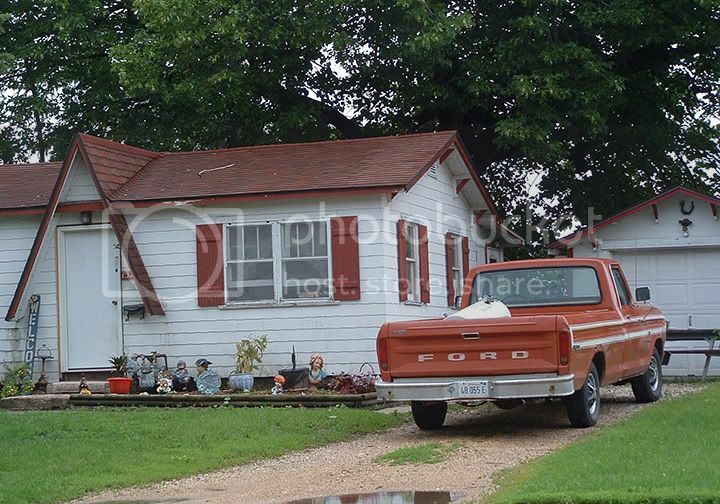 The photographer's eye was caught by the harmonious, rusty reds in this cottage and it's Ford F150, trying to generate some warmth on a cool blue day, but not quite getting to "cheery". What I see in this tableau tells me that this is the home of a person who may live humbly - and knows how to put in a water heater - but who also seems to have a sensibility that might be overlooked at a glance. There is attention to detail, yes, in the red-and white-painted woodwork under the eves, the wavy-edge siding and the unusual A-frame gable over the front door. This taste for subtly eccentric decoration is also seen in the white stripes and elaborate wheel covers on the otherwise pedestrian Ford pickup truck. And if you look closely there are signs that a spiritual person lives within this little house. Not the common yard symbols of Christianity, there is no saint or Virgin Mary among the row of small sculptures in the front bed. There are, however; a basket of artificial flowers, a horse's head (like off a carousel) a bust of a woman who appears to be the St. Pauli Girl or possibly the mate of the bust of the man in the three-cornered hat, what I make out to be either a football player or a spaceman in a helmet, a gnome-like figure with huge head of curly orange hair, what I believe is a mouse eating a piece of cheese, and three struggling potted plants, apparently recently liberated from a long winter spent indoors. What the connections are between these various items and icons is certainly not obvious to me, but there are two signs that are very clear in their meaning: the horse shoe hanging above the garage door, and the "Welcome" sign right by the front door. I had a 1978 Ford F-150 that looked almost identical to the one in your pic. My grandfather gave it to me when I got out of the Navy that year. It was rated as a 5/8 ton truck that allowed it to burn leaded gas. 1/2 ton trucks had to, by law, burn unleaded. In Texas that truck was called a Ford F-150 Explorer and it had the cheapest automatic transmission that you can imagine. Good truck, though, I loved it. Anon. - I love hearing stories about trucks or cars getting passed from one generation to the next. There are very few objects that we use every day that last long enough to do that. And the attachments that people for to a sturdy truck, or a car that has taken you safely from place-to-place are really strong. Maybe you can help me with something. I've always wondered who was the first Ford dealer in Taxes to stamp the name of the dealership into the rear bumper of pickups/ Every single time I see this, the truck is from Texas. Do you know who strated doing this and when? It's a great tradition - sort of like branding cattle.